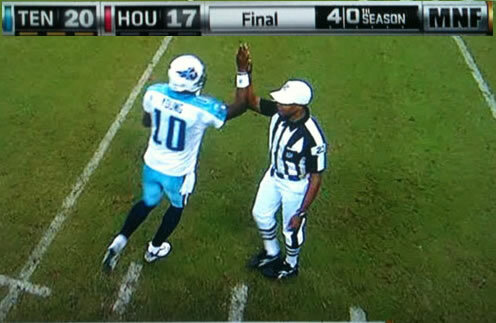 After the Tennessee Titans beat the Houston Texans on Monday night, Titans quarterback Vince Young appeared to exchange a high five with referee Jerome Boger. The league says that’s not what happened. After the apparent high five became a topic of conversation on sports talk radio and on ESPN, the Houston Chronicle called the league to ask about it. And the league said there was no high five. “It was not Jerome Boger’s intent to exchange a high-five with the player,” a league spokesman told the paper. “As Vince Young took a knee on the game’s final play, Jerome Boger jogged in with his right arm in the air to signify the play was over. That is the proper administrative signal for the referee. So just because their hands were raised and their palms made contact, that does not constitute, in the official opinion of the NFL, a high five. It sure looked like Boger and his crew were Titans fans on Monday night based on some of the calls and non-calls that they made in the game. Let’s assume that what the NFL is saying is correct then Kyle. Then should Vince young be fined for touching the official? What about the situation with Pete Morelli & Brett Favre. Favre did the same thing with Morelli. I thought the officiating Monday night was really good and was impartial. I dislike both of those teams and as a Official in a high school league I believe all the appropriate calls were made in watching the game. Kyle is right about the appropriate signaling for a dead ball or end of play. If Jerome Boger who I believe is by far one of the most consistent officials in the NFL believed that Vince Young was out of line he could have given him an unsportsmanlike conduct or in his end of game report could of noted that incident for the league to further investigate. I really don’t see why this is such a big issue. I just had the chance to watch the replays over again on ESPN. While Boger does initially have his hand up to signal the end or play, you can clearly see it start to come down. Then as Vince Young walks by with his hand raised, Boger raises his hand up again. It obviously didn’t do anything to the game, but in the era of sports scandals, the NBA referee issues, this should be frowned upon. I didn’t see or hear about the Favre/Morelli issue. Really? How about a horsecollar that was not a horsecollar on the Titans final drive? That was a huge call. How about a nasty chippy game and one team gets called for 3 personal fouls, and the other none? Not saying the officials cost the Texans the game, but still, this raises some concerns, especially since Bogar should have overruled the horsecollar since he was right behind the play. I understand and agree with you. I’ll bet Jerome would like to take it back if given the chance. I’m not real sure just where the referees were found but this year has been the worst year ever that a referee has ever been on the football field. Take for instance the Giants & Cowboys game today. When Manning threw the ball to Jacobs (74 yard td run) there was holding all the way down the field by the Giants (of course the referree standing right in front of them could not see it – but of course we know how honest referees are). Then just about every play Romo is hit, driven to the ground, thrown to the ground (if you don’t believe me look at the replays), but no penalties called. Roy Williams is grabbed by the defender and spun around – no penalty even though it was pass intereference. Come on – if the referees are going to assist a team – at least be smart about it and try to make it look like an honest mistake. It is not just the Cowboy games they have made such bad calls (it is all of the games). My husband is BCA Referee (hell I’m a BCA Referee) and if our performace was as bad as the performance by the NFL referees this year – we would b fired. I have been a dedicated football fan just about my entire life – but if I ever quit watching it will be because of the inefficiency of the most ignorant, disorganized, and quite frankly stupid bunch of men ever placed in striped shirt on the football field. I too officiate High Shool sports ( Baseball ,Basketball, and Football), in saying that I will say I have learned the difference in the HS,College, and Pro rules of each sport. I will not use the camera angle of the fan to try and accuse any official of wrong doing. The angle the official sees is the one the call is based on, not the perception of what the camera shows. I as well as any official ever would be stating a falsehood should they state they never missed a call. I don’t like the tuck rule, but it is there so it should be officiated. The 1 rule I see overlooked is assisting the runner( ball carrier ). I too officiate High Shool sports ( Baseball ,Basketball, and Football), in saying that I will say I have learned the difference in the HS,College, and Pro rules of each sport. I will not use the camera angle of the fan to try and accuse any official of wrong doing. The angle the official sees is the one the call is based on, not the perception of what the camera shows. I as well as any official ever would be stating a falsehood should they state they never missed a call. I don’t like the tuck rule, but it is there so it should be officiated. The 1 rule I see overlooked is assisting the runner( ball carrier ). I would love the opportunity to officiate at that level.